Roto Cone Vacumm Dryer is suitable for drying of materials which cannot resist high temperature, materials which are easily oxidized, volatile materials which should be retrieved, materials that are strong irritants and poisonous in nature. The Roto Cone Dryer with improved technology integrates during operation under vacuum. The Roto Cone Dryer facilitates enhanced drying efficiency, low temperature operation and economy of process by total solvent recovery. It helps cGMP base working by achieving optimum dust control, while offering advantages of efficient charging and discharging of materials. • Uniform material shuffling over the heated contact surface of the cone. • Inner shelVCone and contact parts in SS 316. • Stearn/HW water Jacket in SS 304. • Insulation with jacket in SS 304. • Cyclone separator in SS 316. • Butterfly valve (SS316) at discharge port with dummy and hand wheel. • Stand and Structure in SS 304/MS with SS304 cladding. Drive unit enclosed with SS304 Covers. • Dry Mechanical Seal for vacuum side. • Dry Mechanical Seal for Waterside. • FLP Motor & FLP Control panel enclosed in SS304 panel. • Digital Temperature Indicators (FLP) at Hot Water inlet and outlet. • Digital Temperature Indicator (FLP) and Dial Vacuum Gauge in vapor line. • Digital Temperature Controller (FLP) with Pneumatic Valve at Hot water inlet. • Provision for Nitrogen purgingNacuum release with interlocking to isolation valve. 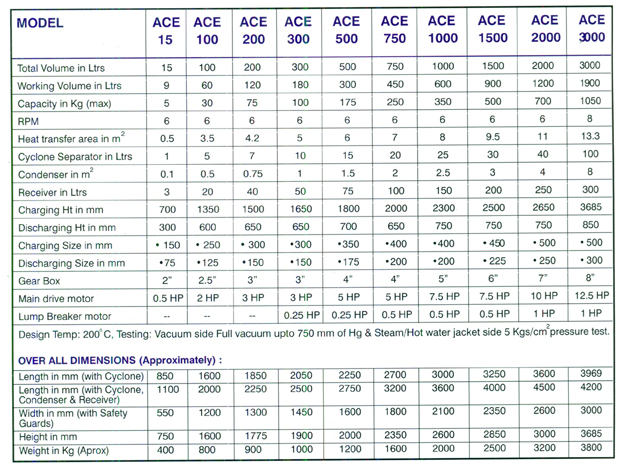 • Temperature and Vacuum Gauges (Dial Type) on Cone. • Safety Guard/railing telescopic type with limit switch (FLP) with interlocking. • Drain plug and safety valve on HW/Steam Jacket. • Pulse jet type dust filter is provided in side the cone. • Positioning wheel /inching button for cone. • Gear Box & Motor Direct Coupled and Gear Box to Cone Drive shaft Bull Gear-Pinion Gear Drive. • Extended shaft (drive side) so that drive unit can be kept in service zone (d required). 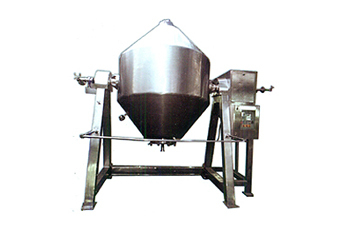 • Vacuum loading system of wet material into the Cone. FINISH : • Internal 320 grit mirror polish and outer 180 grit mat finish. • VFD for Drive Motor with RPM indicator. • Condenser and Receiver in SS316 instead of SS304. • Lump breakers with FLP motor, Mechanical seals and electrical slipring joint. • Auto Bin loading mechanism with timer control and Bins. • Vacuum pump with FLP motor. • Hot water system (steam heated) with tank and circulation pump.